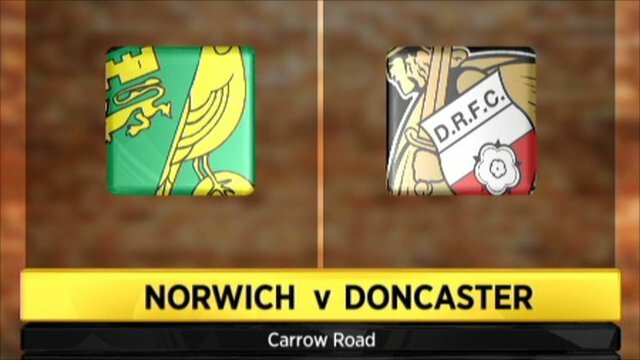 Doncaster left Carrow Road with an unlikely point as Adam Drury's late own goal proved costly for Norwich. The hosts were slow out of the blocks but took a 1-0 lead into the break thanks to leading scorer Grant Holt. Defender Drury went on a surging run down the left and found Holt lurking in the six-yard box, and the striker found the net with a first-time shot. Drury, however, ruined his good work when he inadvertently headed John Oster's corner into his own net. The draw will come as a welcome boost for the visitors whose confidence had suffered a blow after four straight defeats and only one win in their previous nine league matches. Indeed, Rovers chairman John Ryan had wanted to postpone the game because of injuries to 11 first-team players. Doncaster held their own in the first-half, with impressive new loan singing Frank Moussa having a goal-bound shot blocked by Norwich defender Elliott Ward. But Holt gave the hosts the lead in the 31st minute when he struck high into the roof of the net for his 15th goal of the season. Norwich settled after their opener and Holt nearly doubled the advantage only to squander a glit-edged chance from another dangerous Drury cross. Holt and Aaron Wilbraham both had further chances before the visitors deservedly equalised in the 83rd minute. 90:00+5:13 The referee blows his whistle to end the game. 90:00+2:51 The referee blows for offside. John Ruddy takes the direct free kick. 90:00+1:05 The offside flag is raised against Simeon Jackson. Direct free kick taken by Neil Sullivan. 90:00+0:44 A cross is delivered by Korey Smith, save by Neil Sullivan. 88:57 Substitution Franck Moussa goes off and Dennis Souza comes on. 87:34 The official flags Jason Euell offside. John Ruddy takes the direct free kick. 87:34 Substitution Simeon Jackson on for Wesley Hoolahan. 86:27 Wesley Hoolahan takes the outswinging corner, Zak Whitbread takes a shot. Wayne Thomas gets a block in. 86:22 The ball is crossed by Wesley Hoolahan, clearance by George Friend. 86:00 Centre by John Oster, Effort from 12 yards by Jason Euell. Save by John Ruddy. 84:28 Andrew Surman takes the inswinging corner, Elliott Ward gives away a free kick for an unfair challenge on Dean Shiels. Neil Sullivan takes the direct free kick. 84:09 Russell Martin delivers the ball, Aaron Wilbraham takes a shot. Clearance by George Friend. 82:56 Inswinging corner taken right-footed by John Oster played to the near post. Assist by John Oster. 82:56 GOAL - Adam Drury:Norwich 1 - 1 Doncaster Adam Drury heads into his own net. Norwich 1-1 Doncaster. 82:27 The ball is delivered by Joseph Mills, Korey Smith manages to make a clearance. 81:38 The ball is swung over by John Oster. 81:02 Andrew Surman is caught offside. Neil Sullivan takes the direct free kick. 79:21 Substitution Henri Lansbury leaves the field to be replaced by Korey Smith. 79:11 The ball is swung over by Aaron Wilbraham, clearance made by Wayne Thomas. 78:29 Free kick awarded for a foul by Paul Keegan on Wesley Hoolahan. Free kick taken by Adam Drury. 77:42 Henri Lansbury produces a cross, Grant Holt produces a drilled left-footed shot from deep inside the penalty box which goes wide of the left-hand upright. 74:41 Unfair challenge on Aaron Wilbraham by Joseph Mills results in a free kick. The free kick is swung in left-footed by Wesley Hoolahan. The referee blows for offside. Neil Sullivan restarts play with the free kick. 72:29 John Oster takes a shot from deep inside the box clearing the bar. 72:20 Franck Moussa delivers the ball, clearance made by Adam Drury. 71:58 Effort on goal by Andrew Surman from 20 yards. Wayne Thomas gets a block in. 70:23 Free kick awarded for a foul by Grant Holt on George Friend. George Friend restarts play with the free kick. 68:54 Free kick awarded for a foul by Jason Euell on Zak Whitbread. Direct free kick taken by Elliott Ward. 68:54 Substitution Andrew Surman comes on in place of David Fox. 66:26 Grant Holt produces a cross, Andrew Crofts has an effort at goal from just inside the box that misses to the left of the goal. 64:49 Free kick awarded for a foul by Dean Shiels on Wesley Hoolahan. Centre by David Fox, Headed effort from deep inside the area by Aaron Wilbraham misses to the right of the target. 62:39 Dean Shiels is ruled offside. John Ruddy takes the free kick. 62:12 The ball is crossed by Russell Martin, Aaron Wilbraham takes a shot. Neil Sullivan makes a save. 61:22 Grant Holt is penalised for a handball. Direct free kick taken by Wayne Thomas. 61:03 The ball is crossed by Dean Shiels, save by John Ruddy. 59:46 Jason Euell challenges Elliott Ward unfairly and gives away a free kick. Free kick taken by Zak Whitbread. 58:45 Centre by Henri Lansbury, Grant Holt produces a right-footed shot from the edge of the box and misses to the right of the target. 58:45 Substitution Dean Shiels comes on in place of Brian Stock. 56:15 Henri Lansbury delivers the ball, save by Neil Sullivan. 55:28 John Oster takes a inswinging corner from the left by-line played to the near post, clearance by Elliott Ward. 54:14 Free kick awarded for a foul by Elliott Ward on Franck Moussa. Strike on goal comes in from John Oster from the free kick, Andrew Crofts makes a clearance. 54:14 Booking Booking for Elliott Ward for unsporting behaviour. 53:18 The ball is crossed by Andrew Crofts, Neil Sullivan makes a save. 52:31 Franck Moussa is ruled offside. John Ruddy takes the free kick. 52:21 Russell Martin delivers the ball, clearance by Sam Hird. 51:43 Shot from 20 yards from Franck Moussa. Save by John Ruddy. 51:11 Aaron Wilbraham produces a right-footed shot from just outside the box that misses to the right of the goal. 49:56 The ball is crossed by Russell Martin, John Oster manages to make a clearance. 49:50 A cross is delivered by Adam Drury, clearance by Wayne Thomas. 49:09 Corner taken right-footed by David Fox from the left by-line, Shot by Elliott Ward. Clearance by Paul Keegan. 48:54 A cross is delivered by Russell Martin, Effort on goal by Henri Lansbury from 12 yards. Blocked by George Friend. 45:00+1:15 The first half comes to an end. 45:00+1:05 The ball is sent over by Grant Holt, save by Neil Sullivan. 45:00+0:19 Unfair challenge on Henri Lansbury by John Oster results in a free kick. Direct free kick taken by Adam Drury. 43:15 The ball is swung over by Adam Drury, Strike from close range by Grant Holt clears the bar. 43:04 A cross is delivered by Wesley Hoolahan, clearance by Paul Keegan. 42:33 Shot by Henri Lansbury. Blocked by Wayne Thomas. 42:05 David Fox takes the outswinging corner, clearance by George Friend. 41:20 The ball is swung over by Russell Martin. 39:37 The ball is crossed by Wesley Hoolahan, Foul by Henri Lansbury on Sam Hird, free kick awarded. Neil Sullivan takes the direct free kick. 38:13 The ball is sent over by John Oster, save made by John Ruddy. 37:10 Outswinging corner taken by John Oster, clearance by Henri Lansbury. 37:04 Brian Stock crosses the ball, clearance by Adam Drury. 36:27 Corner taken right-footed by Brian Stock from the left by-line to the near post, Andrew Crofts makes a clearance. 35:56 Foul by Grant Holt on Joseph Mills, free kick awarded. Joseph Mills takes the direct free kick. 34:35 The ball is swung over by Andrew Crofts. 33:35 The ball is swung over by Adam Drury, clearance by Mark Wilson. 33:30 Russell Martin sends in a cross. 31:25 The ball is sent over by John Oster. 30:10 The assist for the goal came from Adam Drury. 30:10 GOAL - Grant Holt:Norwich 1 - 0 Doncaster A goal is scored by Grant Holt from close in high into the middle of the goal. Norwich 1-0 Doncaster. 25:55 Wesley Hoolahan concedes a free kick for a foul on Franck Moussa. Free kick taken by Wayne Thomas. 25:55 Booking Wesley Hoolahan receives a caution for unsporting behaviour. 24:54 John Oster concedes a free kick for a foul on Adam Drury. David Fox delivers the ball from the free kick right-footed from left channel, clearance by Brian Stock. 23:31 The ball is sent over by Adam Drury, George Friend makes a clearance. 23:23 Wesley Hoolahan crosses the ball, clearance by George Friend. 22:38 The ball is crossed by Aaron Wilbraham, save by Neil Sullivan. 21:40 Wesley Hoolahan delivers the ball, clearance by George Friend. 20:29 The ball is delivered by Andrew Crofts, Brian Stock manages to make a clearance. 19:04 Russell Martin challenges Franck Moussa unfairly and gives away a free kick. Joseph Mills restarts play with the free kick. 17:40 The referee blows for offside. Free kick taken by John Ruddy. 16:54 Franck Moussa crosses the ball, David Fox manages to make a clearance. 16:46 The ball is delivered by Franck Moussa, Elliott Ward manages to make a clearance. 16:12 Centre by Russell Martin. 15:15 Unfair challenge on Grant Holt by Wayne Thomas results in a free kick. Free kick taken by Grant Holt. 14:20 Foul by Grant Holt on Joseph Mills, free kick awarded. Neil Sullivan takes the direct free kick. 12:35 The official flags Grant Holt offside. Direct free kick taken by Neil Sullivan. 12:24 Paul Keegan sends in a cross, John Ruddy makes a save. 11:58 Corner from the left by-line taken by Brian Stock, Grant Holt manages to make a clearance. 11:39 Franck Moussa has a drilled shot. Elliott Ward gets a block in. 10:57 Mark Wilson produces a curled right-footed shot from 25 yards. Save made by John Ruddy. 10:48 The ball is sent over by Joseph Mills, clearance by David Fox. 10:00 Grant Holt is flagged offside by the assistant referee. Neil Sullivan restarts play with the free kick. 9:07 Shot by Henri Lansbury. Save by Neil Sullivan. 9:01 Russell Martin sends in a cross, Brian Stock manages to make a clearance. 6:48 Adam Drury challenges Franck Moussa unfairly and gives away a free kick. The free kick is delivered left-footed by Joseph Mills from right channel, John Ruddy makes a save. 3:11 The ball is sent over by Brian Stock. Handball decision goes against Mark Wilson. John Ruddy restarts play with the free kick. 1:53 Free kick awarded for an unfair challenge on Franck Moussa by Wesley Hoolahan. Brian Stock delivers the ball from the free kick left-footed from right channel, save by John Ruddy.